Sometimes an athlete is defined by where a player is taken in his sport’s draft. O.J. Simpson and Bruce Smith always will be examples of great first-round picks by the Bills. 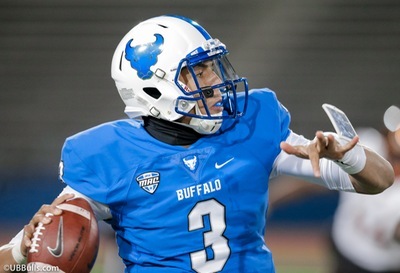 Aaron Maybin and Eric Flowers will be remembered as two of Buffalo’s first-round flops. Tom Brady – you may know the name by now – is associated with his sixth-round selection by New England, proving that all of the scouts can be wrong sometime. Occasionally, though, a player is more defined by the pick made right after his selection. Buffalo has two shining examples of that. In 1977, the Sabres had the 14th pick in the first round. They already had a lot of offense, thanks to players like Gil Perreault, Rick Martin, Rene Robert and Danny Gare. They decided they needed a two-way forward in that spot. As Punch Imlach said later, the last thing the team needed was another scorer. Therefore, they picked Ric Seiling. As we know now, Seiling was a good two-way player. He even scored 30 goals in the 1980-81 season. The winger suffered an eye injury along the way, so he didn’t quite have the career that was forecast for him. No one, though, could call him a wasted pick. His problem, though, was that he wasn’t Mike Bossy. Bossy was taken in the No. 15 spot by the New York Islanders. He scored 53 goals as a rookie, and played like a Hall of Famer until he retired in 1987. Bossy scored a total of 573 goals, which included five 60-goal seasons. It’s fair to say the Sabres could have found a spot for Bossy somewhere, or traded him eventually for someone really good. Seiling’s pick has been the standard for hindsight in Sabre drafting for the past four decades. It took more than three of those decades for the equivalent to emerge. In 2010, the Bills needed a big defensive tackle badly. They grabbed Torell Troup in the second round, which was pick No. 41. Troup had a so-so rookie season, but showed up at training camp in 2011 ready to go. He started well, but then started picking up an assortment of injuries. One of them was a disc problem, which eventually led to surgery. Troup never recovered. He admits he played when he shouldn’t have played, which almost without doubt shortened his career. That happens in pro football. But Bills’ fans know all about the guy taken right after Troup – Rob Gronkowski. He’s the New England Patriots’ tight end who appears headed to the Pro Football Hall of Fame when he retires. And it’s not as if the Bills were unaware of Gronkowski’s skills. He played some high school ball just up the road at Williamsville North. Gronowski might not be packing for Canton if he were drafted by the Bills and their list of quarterbacks, but he’d still be mighty good. Troup once told The Buffalo News that he hears about it whenever Gronkowski scores a touchdown or two in a game. Maybe Seiling is the only one who understands what he’s going through. I’ve gone through the Bills’ picks in the first three rounds of the draft since the AFL/NFL merger 1967. I searched for situations where the next player taken was at least a Pro Bowler, and was an obvious improvement in productivity. Sometimes I eliminated a pick from consideration if the Bills chose someone who helped them out, and therefore was roughly equivalent to the player they didn’t take. First round in 1978 – Terry Miller (RB) over James Lofton (WR): With O.J. Simpson gone, the Bills needed a running back badly. Miller gained 1,060 yards as a rookie, and then saw his career unravel like a cheap suit. Lofton is in the Hall of Fame, and even had some good years with the Bills during their Super Bowl run. Second round in 1981 – Byron Franklin (WR) over Rickey Jackson (LB). The Bills already had Jerry Butler and Frank Lewis at wide receiver, so Franklin was there only to provide depth – at least at the start. The pick didn’t work out. Meanwhile, Jackson ended up in the Hall of Fame. First round in 1982 – Perry Tuttle (WR) over Mike Quick (WR): The Bills needed someone who could catch passes. Supposedly, they quickly discovered that Tuttle couldn’t hang on to a ball unless he could bring it to his chest. Quick was one of the league’s best receivers for his first five years as a member of the Eagles. He averaged more than 17 yards per catch in his first three seasons, proving that Quick was indeed quick. First round in 1990 – James Williams (CB) over Emmitt Smith (RB): This comes with a big asterisk. The Bills already had Thurman Thomas as their feature running back, so it’s easy to say the position wasn’t a priority. Therefore, the Bills certainly can be excused for looking elsewhere, as no one knew Smith would become the NFL’s all-time leading rusher. If someone had a better crystal ball, Smith would have gone second to the Jets that year. New York actia;;u picked Blair Thomas, who didn’t work out. As for Williams, he wasn’t much help in his four years with the team. Third round in 2008 – Chris Ellis (DE) over Jamaal Charles (RB): Ellis contributed six tackles in three years to the Bills. Charles had five 1,000-yard seasons with the Chiefs, and was on the Broncos’ roster last season. In fairness, that Bills’ team already had Marshawn Lynch and Fred Jackson at running back, and Charles would have been gone much sooner if scouts thought he was that good. Second round in 2011 – Aaron Williams (DB) over Andy Dalton (QB): It’s not fair to call Williams a bad pick, since his career ended prematurely because of a serious neck injury. But good quarterbacks are more helpful than safeties, and Dalton would have been a solution to Buffalo’s most pressing problem in recent years. First round in 2014 – Sammy Watkins (WR) over Khalil Mack (LB): The Bills thought they needed a wide receiver badly, and had Watkins rated as the best player in the draft. They traded up to the No. 4 spot to get him. Watkins has been OK when he’s stayed on the field, and was traded in 2017. Meanwhile, Khalil Mack has been a tackling machine since Day One with Oakland. 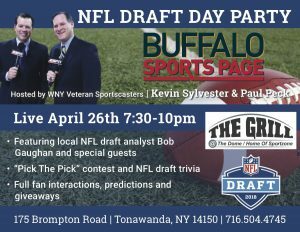 What’s more, Mack played college ball for the University at Buffalo – not far from Gronkowski’s Williamsville North home. Watkins has a chance to make an impact in the years ahead, but it won’t help the Bills in the process. Third round in 1972 – Fred Swenson (DE) over Jim LeClair (LB). First round in 1973 – Paul Seymour (TE) over Wally Chambers (DT). First round in 1974 – Reuben Gant (TE) over Henry Lawrence (T). First round in 1975 – Tom Ruud (LB) over Doug France (T). First round in 1977 – Phil Dokes (DT) over A.J. Duhe (LB). Third round in 1986 – Leonard Burton (C) over David Fulcher (DB). Second round in 1987 – Roland Mitchell (CB) over Tim McDonald (S). Third round in 1991 – Darryl Wren (CB) over Ed McCaffrey (WR). Second round in 2000 – Travares Tillman (S) over Marcus Washington (LB). Second round in 2002 – Josh Reed (WR) over Andre Gurode (C). First round in 2006 – John McCargo (DT) over D’Angelo Williams (RB). First round in 2008 – Leodis McKelvin (CB) over Ryan Clady (T). Remember – other teams passed on all of these players, just like the Bills did. Hindsight really is 20-20.